With the idea of creating a business that combined her love for DIY projects and his masterful carpentry skills, Ericka and Zack Lease drafted a business plan for a DIY studio. In their research, they came across a new, but rapidly growing, franchise called Board & Brush based in Wisconsin. The couple traveled to the Board & Brush headquarters and immediately knew this is how they were going to bring their dream to life. Less than half a year later, Gettysburg’s Board & Brush Creative Studio opened its doors in July 2017. Board & Brush Gettysburg was the first studio to open in Pennsylvania, now there’s six and counting. Similar to the widely popular Paint Nights, customers register for classes and choose a design. When they arrive to class, all the materials are placed at their tables waiting to be assembled. Ericka instructs the class on how to assemble and decorative wood pieces. One of the reasons the Leases opened Board & Brush was because they wanted to bring something creative to Gettysburg. “There isn’t much to do in the evenings, so we wanted create a space for groups to come in and do something creative when there isn’t much else going on,” said Ericka. Customers get a very hands on experience at Board & Brush. At the start of the class they have a pile of raw wood that they assemble, distress, stain and paint using a stencil. Wooden signs are the bread and butter of Board & Brush, however customers have the option to make other items like shelves or boxes. “We cater to all skill levels. We’ve had kids as young as 11 all the way to 80-year-olds,” said Zack. 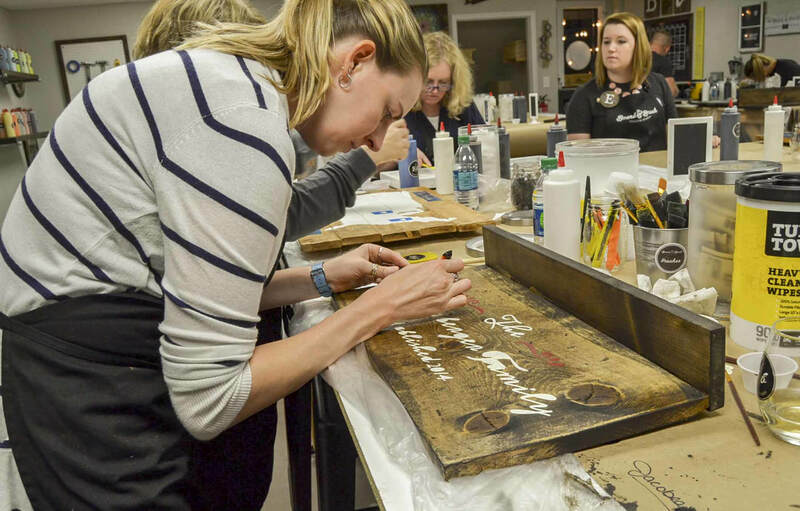 In addition to supplying an evening activity, Board & Brush gives visitors to Gettysburg a creatively immersive experience and get to walk away with a tangible item. “Visitors come to Gettysburg, they make a sign and take it home and display it. It’s not only a sign they are displaying, but also a memory,” said Ericka. When it comes to their favorite part of owning a creative studio in Gettysburg, both Ericka and Zack think the best part is the “cool people” they’ve met. “Once we had this woman register who was going to be moving to Florida shortly. She saw us online and knew she wanted to make a sign. She came back every single weekend until she moved,” said Zack. “We do see people who come back to make more signs. It’s fun and can become addicting to some,” Ericka added. With the success of the Gettysburg Board & Brush, the Leases eventually plan on branching out and opening more studios in surrounding areas.